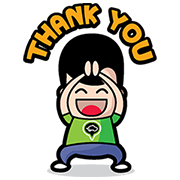 http://www.line-stickers.com/ – GrabTaxi Happy Boy Line Sticker |GrabTaxi, Southeast Asiaʹs largest taxi-booking app presents GrabTaxi stickers. Friend GrabTaxiʹs official account to get them and enjoy your exclusive privileges. Available till February 25, 2015. Previous post Shamitabh – It is Mixture!